While we're seeing another respite in MERS case reports out of Saudi Arabia, the World Health Organization continues to chip away at the backlog of cases, providing us with details on 6 more, including 3 asymptomatic hospital employees from Buraidah. Two cases (Hail and Al- Makhwah city) were diagnosed while hospitalized for other conditions, and are still under investigation. One case (74, F, Riyadh) appears to be a `primary case', with no known exposure. Two nurses, and 1 hospital cleaner - all part of the staff at the hospital in Buraidah which has experienced a prolonged nosocomial outbreak - are in home isolation, having tested positive but remaining asymptomatic. Asymptomatic MERS cases have been known to exist for a couple of years, but only recently has the Saudi MOH paid much attention to them. 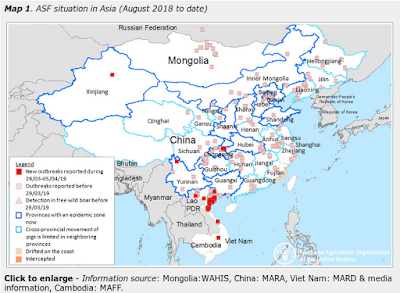 Last September, in WHO Guidance On The Management Of Asymptomatic MERS Cases, we looked at many of the still unanswered questions surrounding mild or asymptomatic infection with MERS-CoV. Between 11 and 12 March 2016, the National IHR Focal Point for the Kingdom of Saudi Arabia notified WHO of 6 additional cases of Middle East respiratory syndrome coronavirus (MERS-CoV) infection. Three of these reported cases are asymptomatic and linked to the MERS-CoV outbreak currently occurring in a hospital in Buraidah city. A 48-year-old male from Hail city developed an unrelated medical condition on 8 March and, on 9 March, was admitted to hospital. On 10 March, while hospitalized, he developed symptoms and, on 11 March, tested positive for MERS-CoV. Currently, the patient, who has comorbidities, is in stable condition in a negative pressure isolation room on a ward. Investigation of history of exposure to the known risk factors in the 14 days prior to the onset of symptoms is ongoing. A 74-year-old female from Riyadh city developed symptoms on 3 March and, on 9 March, was admitted to hospital. 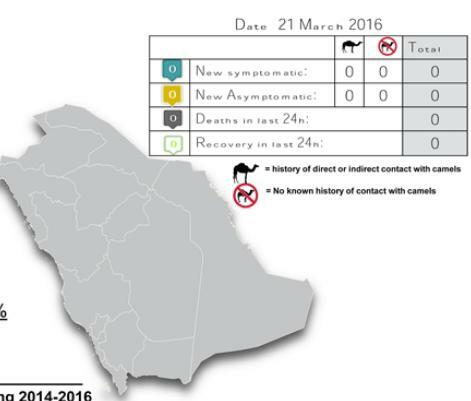 The patient, who has comorbidities, tested positive for MERS-CoV on 11 March. Currently, she is in critical condition in ICU. Investigation of history of exposure to the known risk factors in the 14 days prior to the onset of symptoms is ongoing. An 83-year-old male from Al Makhwah city was admitted to a hospital in Jeddah for an unrelated medical condition on 6 March. On 8 March, while hospitalized, he developed symptoms and, on 10 March, tested positive for MERS-CoV. Currently, the patient, who has comorbidities, is in stable condition in a negative pressure isolation room on a ward. Investigation of history of exposure to the known risk factors in the 14 days prior to the onset of symptoms is ongoing. A 31-year-old, non-national, female health care worker from Buraidah city was identified while asymptomatic through the tracing of contacts of MERS-CoV cases. The patient, who has no comorbidities, works in the hospital where the MERS-CoV outbreak is occurring. She tested positive for MERS-CoV on 11 March. Currently, the patient is still asymptomatic in home isolation. Investigation of epidemiological links with MERS-CoV cases admitted to the same hospital is ongoing. A 29-year-old, non-national female from Buraidah city was identified while asymptomatic through the tracing of contacts of MERS-CoV cases. The patient, who has no comorbidities, works as a cleaner in the hospital where the MERS-CoV outbreak is occurring. She tested positive for MERS-CoV on 10 March. Currently, the patient is still asymptomatic in home isolation. Investigation of epidemiological links with MERS-CoV cases admitted to the same hospital is ongoing. A 25-year-old, non-national, female health care worker from Buraidah city was identified while asymptomatic through the tracing of contacts of MERS-CoV cases. The patient, who has comorbidities, works in the hospital where the MERS-CoV outbreak is occurring. She tested positive for MERS-CoV on 10 March. Currently, the patient is still asymptomatic in home isolation. Investigation of epidemiological links with MERS-CoV cases admitted to the same hospital is ongoing.